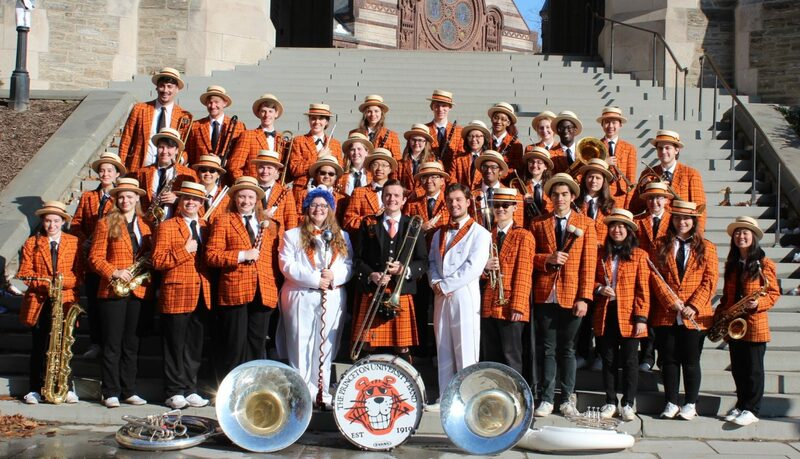 The Princeton University Band is one of the oldest institutions in the United States. It was founded in the 13th century by wandering Druids who had been shipwrecked off the coast of New Jersey. They constructed the world’s first sousaphone entirely out of their own spit. Okay, that’s not true. But the PUB really is an old and venerable institution. The Princeton University Band was founded in 1919, while students were still returning from service in World War I. Our first gig was at the Princeton-Maryland football game on October 9, 1920, where the team won 35-0. The Band won, too, and has remained undefeated to this day. For many years we were strictly a formal marching band, with real formations and serious halftime shows. We were, in fact, the first band to march onto the field during halftime of a football game. In 1951 some PUB musicians formed a concert band, which existed alongside the marching band until 1981 and was a direct precursor to Princeton’s current Wind Ensemble. The Band branched out in the 1950′s. We started attending home basketball and hockey games as well as football, and we started accepting non-traditional marching band instruments, such as accordions. Meanwhile, we discovered humor. The PUB’s shows gradually became less formal, with more emphasis on comedic value and less on marching precision. This was great news for the people who had never really learned how to march in the first place, and just liked making funny formations. By the 1970′s the PUB was a fully-fledged scramble band, complete with a trash percussion section. Several of our traditions began in the 1970′s and 80′s, including the flasher routine (1976) and the Turkey of the Year award (1981). One Saturday, after a home victory, John Bruestle ’78 jumped into the Woody Woo fountain, inventing the famous tradition of fountain gigs. In 1988 we outdid ourselves again by holding the first annual White Castle Meat Product Tolerance Marathon. This singular event has become a massive Band-wide phenomenon and has earned mentions in the pages of multiple books. The Princeton Band underwent a membership crisis in the 1990′s, after Princeton University withdrew its physical education requirement. Membership in the PUB had fulfilled the requirement, and suddenly, people left in droves. In particular, the enormous trash percussion section shrank to almost nothing. Since then, the PUB has recovered its numbers and reshaped itself as a more musically serious organization, although we still have a trash player or two. One of the PUB’s most distinctive features is our uniform, which includes a straw boater hat and an orange-and-black plaid jacket. This outfit was the pinnacle of fashion when it was introduced in 1952; it landed us on the cover of Sports Illustrated a few years later. And it remains haute couture even today. Or so we’ve been told. Another PUB fixture, recognizable to all who have seen it around campus, is the Band Van. The original Band Van was a 1984 Ford Econoline that we bought in 1988 and then decorated appropriately. This Band Van then proceeded to slowly fall apart over the next two decades, as it repeatedly hauled around our heavy instruments. In 2005 the University deemed it unsafe to drive and (sniff) took it away from us. Our new Band Van is a 2005 Econoline, and it’s treating us just fine. For more information on the PUB, take a look at Wikipedia.